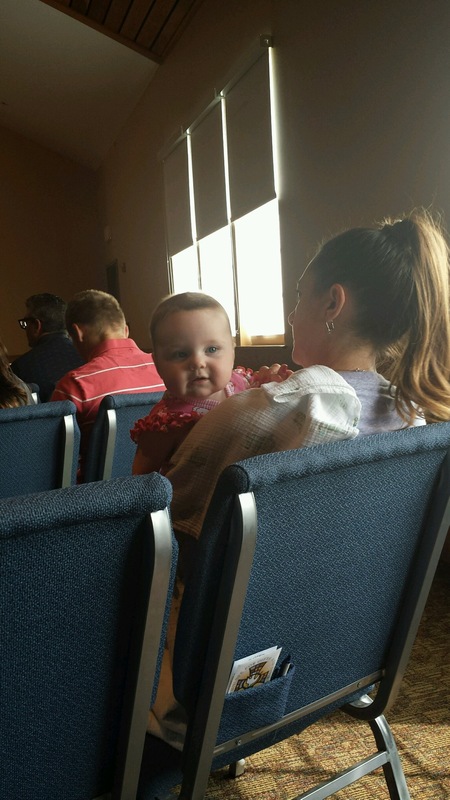 At the six month well visit, Gemma weighed 17 pounds 13 ounces and measured 27.5 inches. 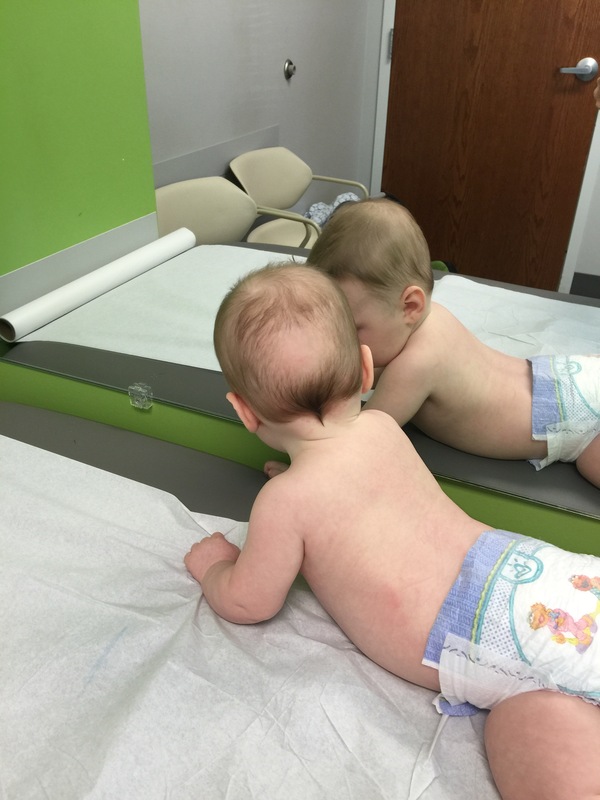 She’s in the 80th and 90th percentile respectively. We have large kids. I knew she had gained weight because lately by evening, my arms feel weak like I have been working out. She loved the mirror at the well-visit. She’s a really good sleeper (yippee). At 4.5 months I tried doing a little sleep training with her naps, but she was too young and it didn’t work. So, we just waited it out and let it happen on its own (for the most part). Once she was about 5 months old, her naps started to fall into place and now she naps two times a day. I have found that if we go walking in the morning, she’ll nap a little and then take a long nap in the afternoon when Ashton does. This is ideal (and why I am blogging in the middle of the day right now, haha). Gemma has been sleeping through the night from a young age, but getting her bedtime under control has been the biggest help lately. She was staying up a little too late and I was missing some of her sleep cues. If she got over-tired, it actually made it harder to get her to sleep. So after a couple nights of letting her cry for just a bit (not nearly as bad as when I sleep-trained Ashton), she goes to bed at 7:30 and sleeps until 8am or longer. YESSSS! Along with sleeping great, she is also eating really great (obviously if she’s gained 3+ pounds in two months). 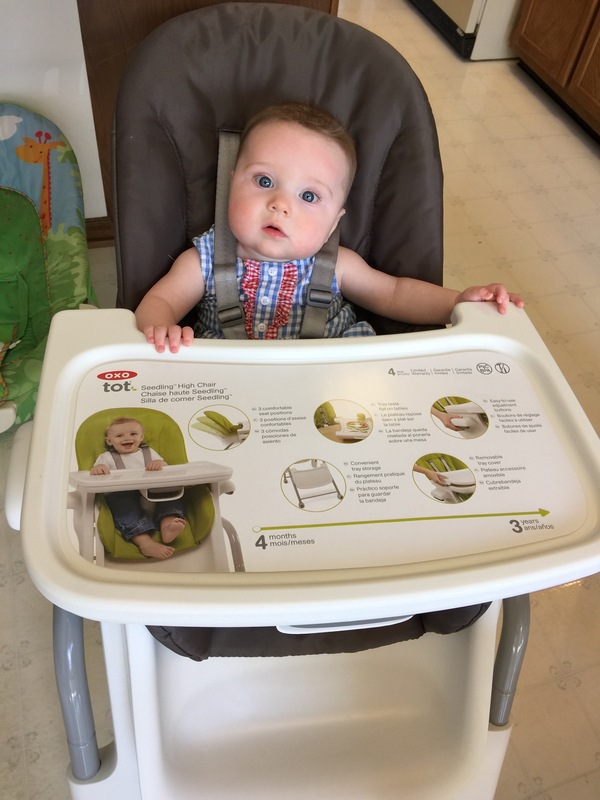 We started trying some foods around 4.5 months, and now she will pretty much eat anything. It took giving her sweet potatoes in the beginning (something tastier than that bland rice cereal) to get her interested in figuring out how to eat off the spoon. Now she’s eaten everything, beans, rice, fruits, veggies (all pureed) along with her formula. 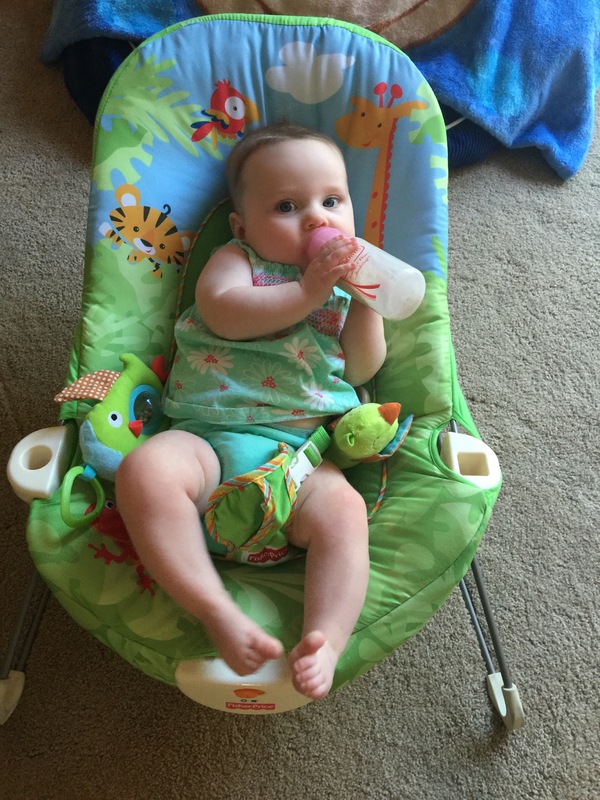 Oh, and she can now hold her bottle and drink it on her own. In her new big chair! Now I don’t have to sit on the floor to feed her in her bouncy chair. Thanks GG! Personality-wise, she is really laid back. She probably has to be with Ashton running around, but she is just so chill. And happy. She is so smiley and giggly. She has really started to babble a lot lately too, I think she is going to be a little chatterbox. She has been rolling for a while, but just started getting up on her hands and knees. 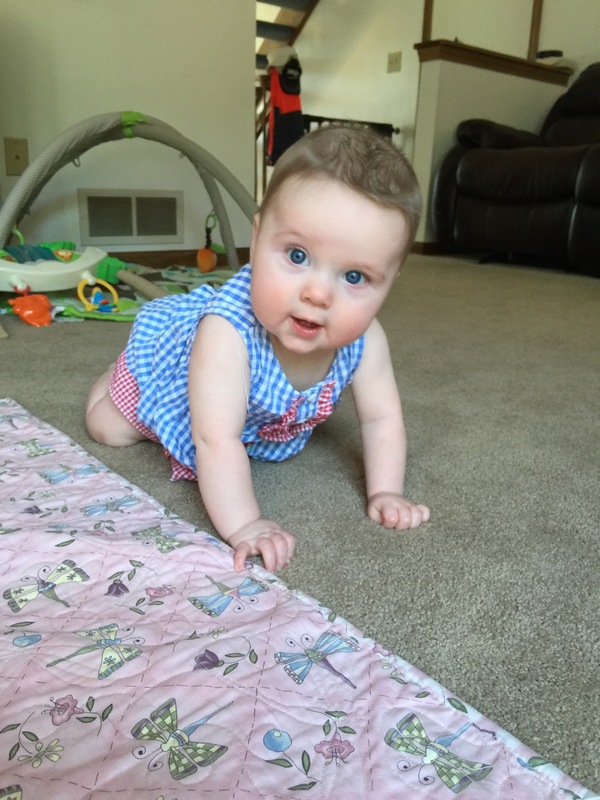 She is so close to crawling! She doesn’t sit on her own, but can when supported. If she had her choice, she would stand all the time. Her legs are so strong and she just loves being up on her feet. 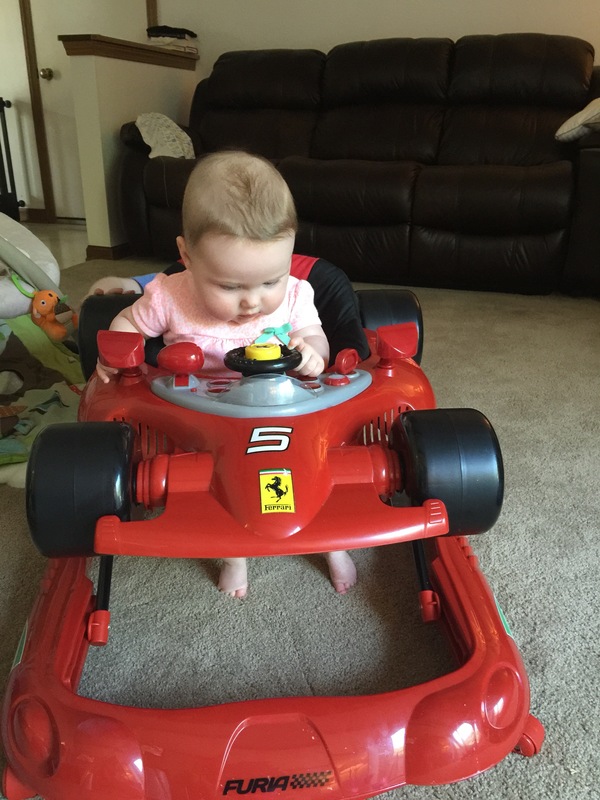 She will definitely start walking earlier than Ashton’s first steps at 15 months. We go to church every Sunday, and she loves the music. She also loves entertaining the people behind us with her smiles. Right now she has two teeth on the bottom, but I think the others aren’t too far behind. A lot of her hair has fallen out, but some seems to be growing back in. 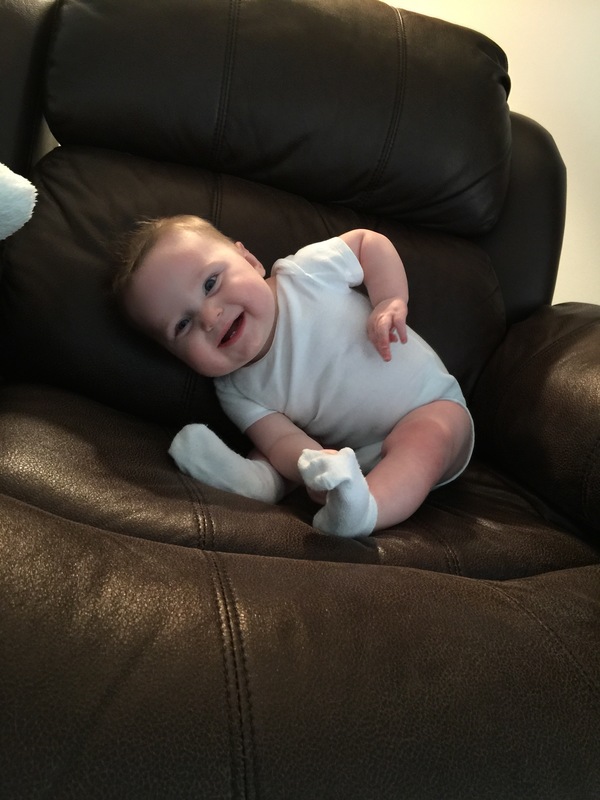 She has some cradle cap dandruff that is almost gone. Her eyes are BLUE and sooooo pretty. She rides in the van like a champ. And that is 6 month old Gemma in a nutshell! Happy Wednesday!